Buck/Boost Voltage Regulation – Offers a more stable AC source during surge and sag events without constant use of internal batteries. Slim-line Profile – Provides users with the ability to install the Entrust Series in a variety of environments. RoHS Compliant – Compliant with European Economic Unions directive on the reduction of hazardous substances (RoHS), in electronic equipment. SentryPlus Software – SentryPlus auto-shutdown and monitoring software is included with every unit. No special downloads or coupons are required. Larger Load Capacities – Minuteman has increased the capacities of the models in the Entrust line, allowing the units to support larger power requirements. 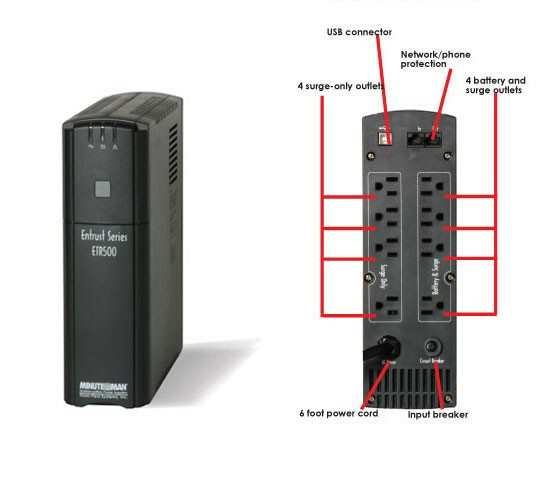 The Minuteman Entrust UPS Series is designed to protect computers and phone from electrical problems. It is perfect for floor mounting and for desktop. It has four fully protected outlets and four surge protected outlets.The Minuteman Entrust UPS Series also offers automatic voltage regulation, spike and surge protection, and battery backup.